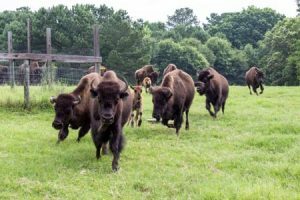 It’s not every day you see buffalo grazing in the South, but Edgefield County residents have that opportunity just five minutes outside the town of Johnston. Buffalo are herding animals and seldom stray far from the herd. Although seemingly docile, a buffalo will show its agitation by pawing the ground and raising its tail, and will act with aggression when provoked and can run at speeds up to 40mph. The buffalo has a shaggy, long, dark brown winter coat and a lighter weight, lighter brown summer coat with typical weights of 1000 pounds for females and 2000 pounds for males. The heads and forequarters are massive, and both sexes have short, curved horns that can grow up to 2 feet long, which they use in fighting for status within the herd and for defense. For the first few months of life, calves are lighter in color, sporting reddish brown coats. The Lone Palm Bison Company, like all bison ranchers, is committed to raising their animals naturally. 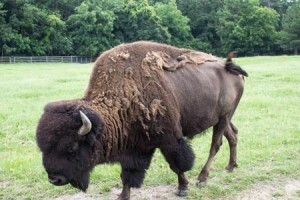 Naturally-raised bison interact with the environment as Mother Nature intended. Their movement across the land promotes healthy ecosystems, and produces a delicious, nutrient-dense meat. The U.S. Department of Agriculture regulations do not allow bison to be raised using growth hormones. According to the National Bison Association, bison meat is lower in fat and cholesterol than beef, chicken and even salmon. Bison meat is higher in protein, iron and Vitamin B-12 than beef. Nutritional comparisons for fat content (per 3.4 oz serving): bison 2.42g, beef 8.09g, chicken (skinless) 7.41g, and salmon 10.97g. Lone Palm Bison Company recently began sales of their USDA-processed bison meat which can be purchased locally or shipped directly to your door. For more information, contact Deb Mauldin at 803-606-6164. 2 Responses to "A Herd of Buffalo in Edgefield County"
Congratulations to the Mauldin’s who are right in saying buffalo pick you.